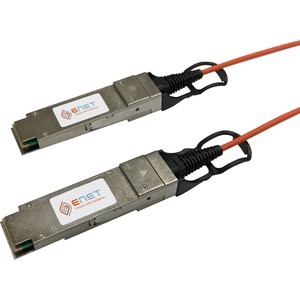 The ENET QSFP-H40G-AOC3M-ENC 40GBASE 3 meters QSFP+ to QSFP+ Direct-Attach Active Optical Cable (AOC) is specifically programmed to be fully compatibility and seamlessly connect Cisco 40G devices to other Cisco 40G devices. Every Cross-compatible and OEM compatible Direct-Attach Active Optical Cable (AOC) product is individually programmed and tested in-house for guaranteed functionality and seamless integration. Our test lab utilizes the latest network switches, servers and routers for compatibility testing as well as industry leading traffic simulation equipment for functionality testing. ENET offers more than 1,000 10G and 40G cross-compatible and OEM compatible direct-attach cable solutions.